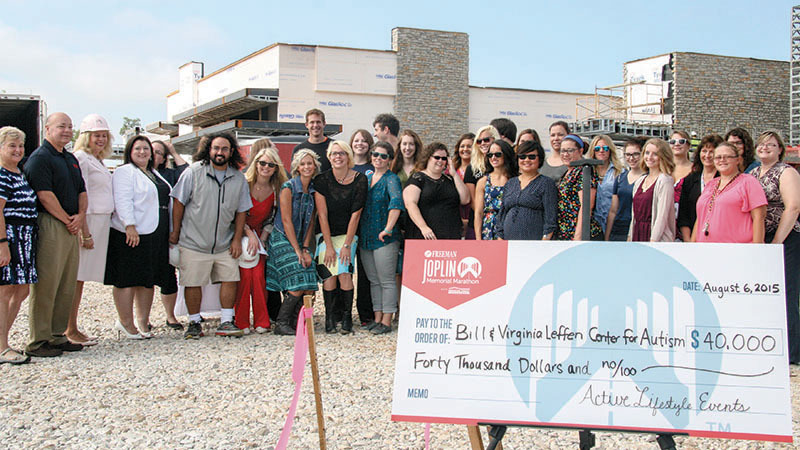 "Active Lifestyle Events Inc. – the organization behind the Joplin Memorial Half – has donated the first installment of a $100,000 gift to the Bill and Virginia Leffen Center for Autism. Active Lifestyle President Audie Dennis presented a $40,000 check to Freeman Health System and the autism center during a news conference on Aug. 6. The donation – the first of three – will fund the construction of two playgrounds and an adjoining picnic area. The Ozark Center for Autism was destroyed in the 2011 tornado. Freeman President and CEO Paula Baker said the autism program – which was renamed in honor of a gift from Bill and Virginia Leffen – has survived in temporary facilities over the last four years. Construction on the $4 million center will be complete by October, according to Clinical Director Kristy Parker. “This is the first and probably only opportunity in my life to work in a center specific to children and adults with autism,” Parker said of the new facility, which the autism center team designed specifically for its needs. Active Lifestyle Events has held annual running events since 2009. After the tornado, the group changed its focus to center on memorializing the victims and helping rebuilding the community. Each year the group holds the Joplin Memorial Half, an event that features a walk of silence, a half marathon, a 5K and a kid’s run. In 2015, the event attracted more than 3,000 runners from 28 states. Next year, the event will feature for the first time a full marathon, according to Dennis."